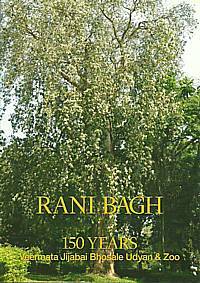 Rani Bagh 150 Years is a tribute to Rani Bagh - Mumbai's only heritage botanical garden, its largest green open space and greatest agglomeration of trees. When such a precious legacy has thrived in the heart of the city for 150 years it calls for a celebration - a celebration that is mindful of its historical, cultural and scientific relevance as also its place in the hearts of the city's residents. The chapters present various facets of the garden through the eyes of writers who cherish it for all the joys it has given and continues to shower on Mumbai's citizens, of all ages and from every walk of life. The garden's early history, planning and design, which are of continuing relevance, are related here in interesting detail, along with a tribute to its enduring legacy that has enriched the lives of people in the city over a century and a half. A substantial chapter provides a tantalizing taste of the botanical wealth to be experienced in Rani Bagh, while another features the fascinating denizens of this rich habitat. The book ends with an account of the recent struggle to preserve the garden's unique natural and built heritage for future generations.